Greetings from Antigua…wish you were here! Photo taken at the Museo Colonial in Antigua, Guatemala. The countless earthquakes the struck Antigua during her colonial days of power, finally forced the capital to be moved to Guatemala City in 1774. Although a lot of the gorgeous architecture created by the Spanish conquistadors had been destroyed and then rebuilt, many of the structure’s ruins can still be viewed today behind the reconstructed buildings. 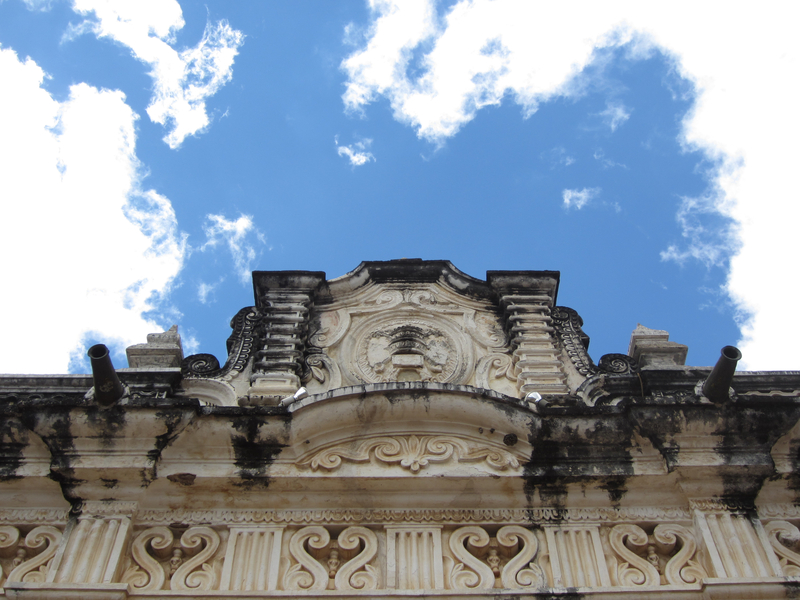 The Museo Colonial had been impacted by the earthquakes yet its grandeur and delicate architecture have remained intact. The museum itself hosts a vast collection of religious pieces of art, however, the real splendor of a visit here is the building itself. It is simply spectacular! I took this picture just as the heavy clouds began to lift and the deep blue sky emerged from its hiding place. I love the effect of the powderpuff clouds, against the deep blue sky and off-white and black hues of the building. Thanks Lucy for bringing me here! And thanks Nicole for opening my eyes again to the beauty of Antigua! That was a fun day!